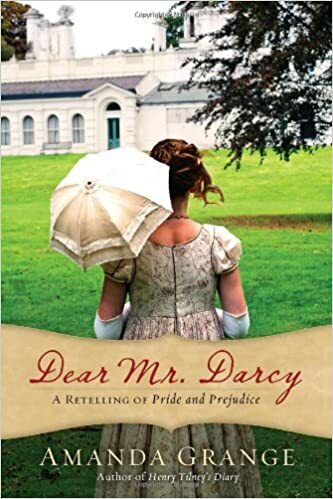 Dear Mr. Darcy is a delightful retelling of Pride and Prejudice in the form of letters. I bought this book months ago, and finally had the chance to read it last week. Plot/Story line: 5/5 Great plot and story line. Amanda stays true to the characters’ personalities that Jane Austen created. The letters feel like real letters that the characters would have exchanged. Characters: 5/5 As stated above, Amanda stays true to the characters that Jane created. No complaints here! Writing: 5/5 Witty and clever, the writing is written in Austen-style and is very enjoyable for those who love Jane Austen. Dialogue: N/A Since no one is really speaking to the other, face to face, there isn’t really what you would call dialogue. Bad Language: About three or four used of d—. But how I typed it is how it appears in the book. There are also three uses of good God. Inappropriate Content: Overall pretty clean. Mr. Wickham does speak of needing to find a rich widow, because he has debts to pay. Want to read/ability: 5/5 Through I didn’t like the bad language, I still overall loved this book. It was a delightful read that I couldn’t put down. I devoured this book in less than a week and I can’t wait to try Amanda’s other Jane Austen retellings. Over-all-rating: 4/5 I would have liked some more letters from Darcy and there was (in my opinion) way too many letters of Mary Bennet’s to one of her friends. They may have been the comic relief, but I didn’t really enjoy them.